And I panicked. I immediately downloaded Avast for Mac and did a full system scan, but everything was clean. After a lot of swearing, sweating, and resisting the urge to smack my laptop, I finally found the answer: a glitch in the LastPass extension that auto-filled fields. Stupid, huh? So that was totally not related to malware and viruses, but the point of story is that no one is immune to these buggers. I could very well have been infected, and after the Heartbleed scare, I think we should all be even more careful. Still not convinced? 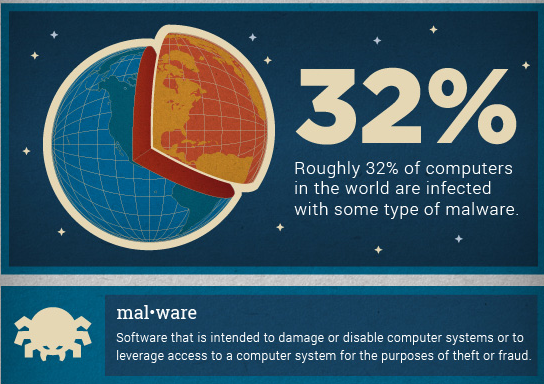 Take a look at this infographic that shows just how infected we – the people of the digital world – are; from viruses to all sorts of malware, the infographic details the rate of infection in countries and what exactly are the types of infection. After reading this, you just might want to make sure your anti-virus software is updated.